In my piece following the draw against the Cads, Varlets and Wicked Rogues XI, I will admit that the tone of my concluding remarks, regarding our play-off-hopes, was probably one of mild pessimism. This wasn’t down to me having glanced at the league table, and seen us five places from the play-offs with the thought of an away game at fellow ‘off chasers Newport County to come. Nor was it because I’d been intensely mulling over our, in-every-sense, wet performance at St Albans City. No, I was simply playing my own game of tactical superstitiousness. Where has belief ever got me? I believed last season and we fell at the final hurdle. Whereas for this year’s cup run, each round was approached with a resignation, on my part, that this would be as good as it got. And thus we thrilled the nation. You’ll ascertain from this how vital a cog in the H&W machine I clearly am. Alright so none of our players could pick ‘Skif’ out of a line-up involving me, four Belisha beacons and a collapsed Wendy House, but, nonetheless, if we go up this season it will all be because of me. Me, the man who heroically maintained disbelief. There I said it. However my stoic, gallant negativity took quite a significant blow during the aforementioned game away at Newport. 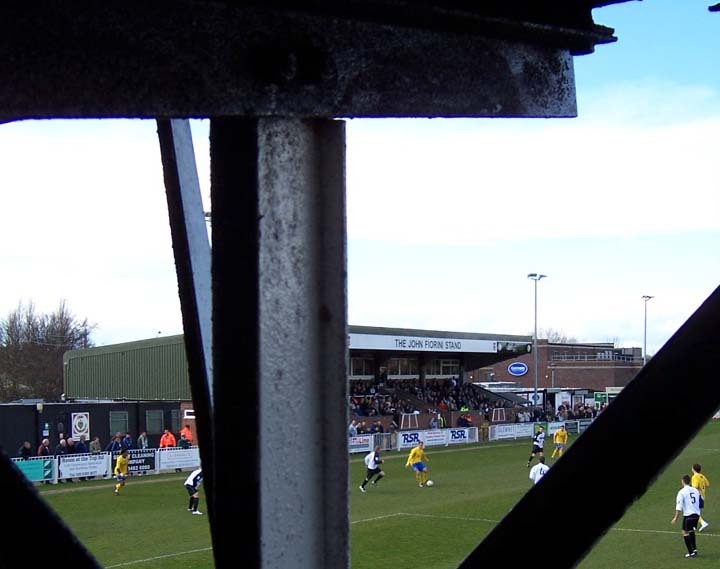 Okay, so we’d followed up the Eastleigh draw with a 2-0 win at home to Sutton, but that was to be expected. 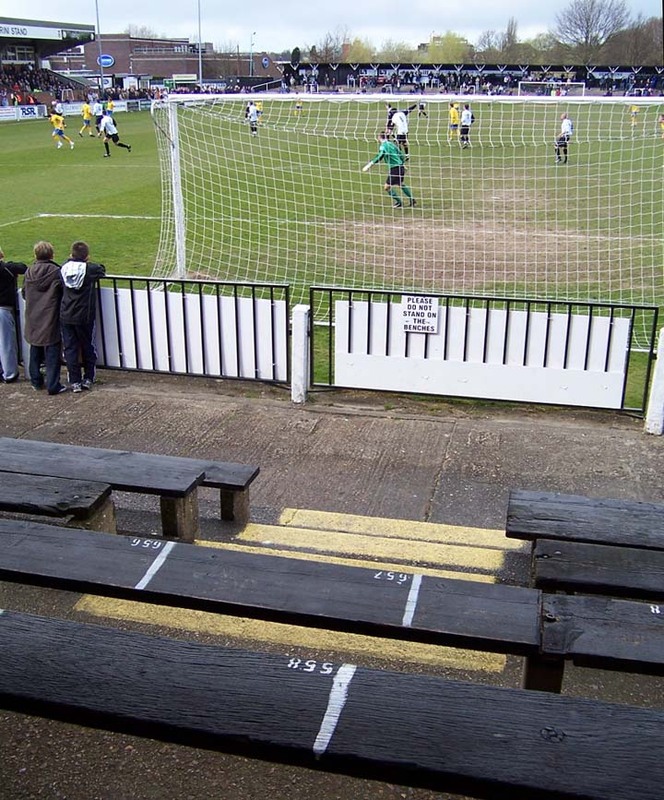 Sutton’s relegation, at kick off, was like a student flat in need of a tidy but with a mollycoddling mother standing by with the marigolds i.e. it was guaranteed to be done and dusted by the end – not even a win would have saved them. I won’t bore you with the maths of that. In theory then, we could take no real pleasure in it, as it was rather like shooting fish in a glove compartment. Of course, while we might have expected these three points to come easy, they still had to be won to prevent all the play-off-chasing air from gusting straight out of our heavy-weather promotion tyres. However, given that the mathematicians behind our goal (who have been working away into the early hours of many a school-day morning attempting to weld best-case-scenarios firmly onto coming events) had already chalked this one into their equations as a home banker, it still meant the hard work was still to do. 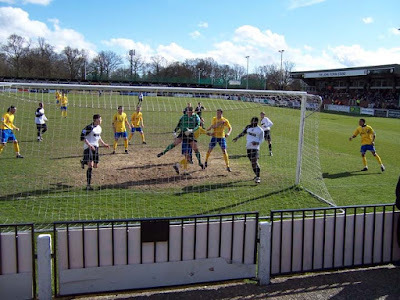 The theme coming through was that we didn’t have to win all of our remaining five games to remain in contention of fourth or fifth place which, when facing Newport and Bromley away from home within a four day period, was certainly a relaxant. Given that Newport County were also gunning for a spot and, prior to the game, both a point ahead and a game behind us, this was the fixture, of those remaining, that we thought would have to be our loss-leader. However we went there, benefited from a Paul Cochlin own goal then defended stoutly under heavy pressure for over an hour to come home with a one-nil win; a victory that meant a return to the abacuses, and a wavering of the Skiffoid cynicism. I began to believe. Frankly, I was devastated. Having jumped up four places in one night, we were now within goosing distance of Bishops Stortford in 5th place and our first return to the play-off zone since mid-September. Clearly one should try to repress positive thoughts, drive them deep down inside, as what was given with one hand, was soon taken away with another. In this case it was Bromley’s hand, thrusting a big old stick between our spokes. Having taken the lead in the third minute, Rocky Baptiste levering in a shot from the edge of the box into the top corner, we largely coasted the first half an hour. Behind the goal we had not a care in the world, even finding time to knock out a full, epic “Give as an H...AIIIIIITCH...” which, given there were a couple of false starts as we struggled to remember how to spell it (it is very long, people), pretty much took us up to half time. 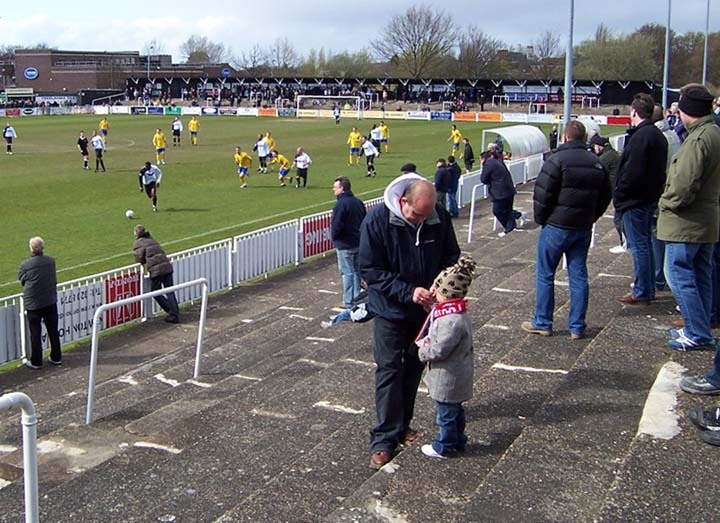 After the half-hour (and roughly the "L...EEEEEEELLL") mark though, Bromley began to look a bit more dangerous, but we appeared to be weathering their attacks in solid enough fashion. In the second half, rather than come out with renewed energy, we left our confidence on the physio table. This was odd given that, after Wednesday night’s inspired work, it shouldn’t have been in need of any therapeutic attention anyway. As the half wore on, the more leggy we appeared; usually inspirational captain Jamie Collins looked as lost as a toddler absent-mindedly left behind in an underground car park after a long shopping trip. 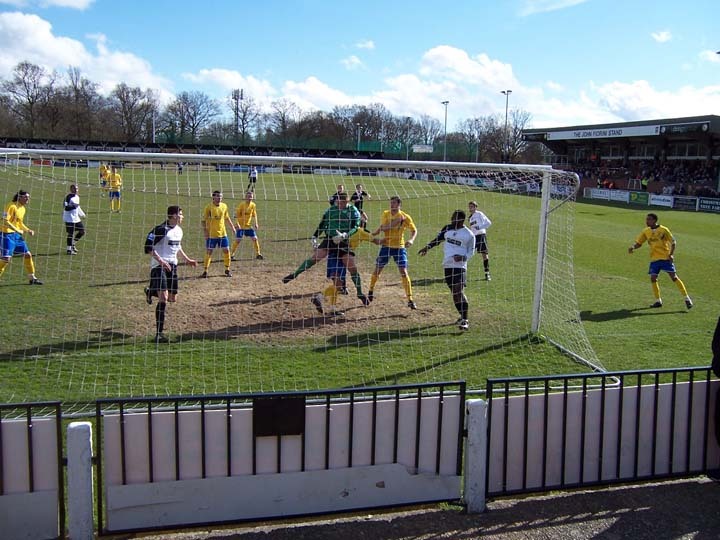 As such it wasn’t a shock that Bromley were able to draw level on the hour, Omari Coleman scoring with a brilliantly placed header, nor that they should take the lead eleven minutes later through Danny Hockton’s crisp shot. In my Eastleigh reportage-come-bitchfest I mentioned the parallels with last season’s run-in, in that one-all draws were continuing to be popular away from home in the spring. This very weekend last season that sequence was interrupted by a 2-1 defeat away to a side whose promotion ambitions were over. Said defeat caused frustration behind the goal which then affected sensitivities and increased tensions, boiling over into stand-up rows and such. For 2007, now read 2008, as 2-1 it finished amidst less then comfy silence on the terrace. When people care passionately about something, this is perhaps to be expected, but one would hope that our season doesn’t peter out in such an atmosphere particularly when you consider that, whether we make the play-offs or not, this has been our finest season to date. However, those who continue to re-evaluate our karmic equity will tell you that we remain a whole point in credit, assuming you accept the view from a week ago that we could happily draw both these last away games if we then went on to win our final three, all at home. As two of those games involve sides scrapping against relegation, they will not be easy rides against teams dreaming of string vests, knotted hankies and a sturdy deckchair. However good our form is, I can only feel gloomy at our prospects of tucking in late-doors. And in that one strategic sentence I have guaranteed us glory. Although if anyone’s asking, of course [winks and taps side of nose twice], I haven’t.